To introduce Site licence- PC DoorGuard, we are offering a $2000.00 SPECIAL LIMITED TIME OFFER for this version! Click here to order now! 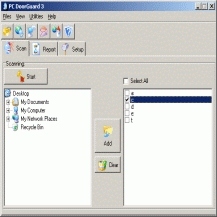 Site licence for PC DoorGuard allows you to use PDG within your organisation on an unlimited number of computers. A very extensive and thorough intrusion scanner that scans any media on your PC for backdoors and trojan horses. PDG easily removes any found trojan with a click of a button, together with any elements it may have left in registry/system files/memory. PDG also constantly monitors your system to prevent further infection, using weekly updated trojan database consisting of more than 5000 entries. Running trojan/process killing, editing registry, monitoring open ports,- all this provides highly secure environment for your PC. Features: any running hidden processes and windows can be seen and terminated, update over the Internet with a click of a button, on the fly checking all the files you download, get via email or execute. PC Door Guard does not intercept system resources, thus allowing you to use it with any other anti-virus application for maximum protection.